You are obviously talking about the filename and your filename is created on the tags-fields TRACK, TITLE and ARTIST. Are these tagfields not filled properly? According to your screenshot they seem to be. 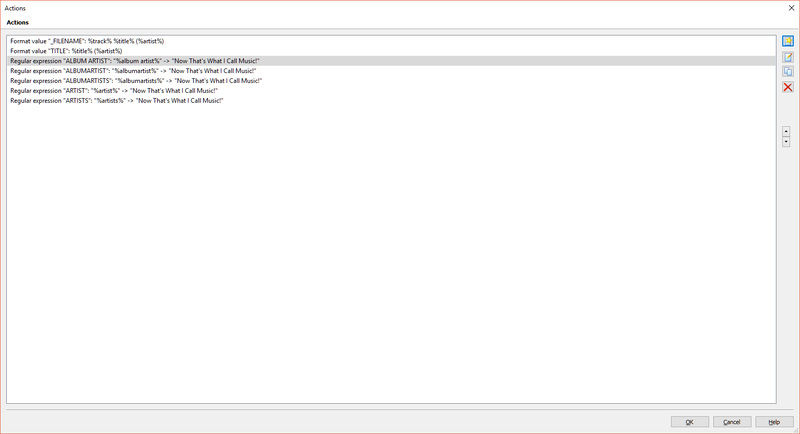 So why not just rebuild the filename from the tags by an action of the type "Format Value" or the converter Tag->Filename, which gives you a preview. Wow, thanks. I can't believe it was that simple. I made it work for the title as well. Not sure what I am doing wrong. I tried standard replace as well. I know I could change the artist manually in extended tags but I am trying to make the process quick and easy. I Have tried a number of variations since my last post and still have not managed to achieve this. 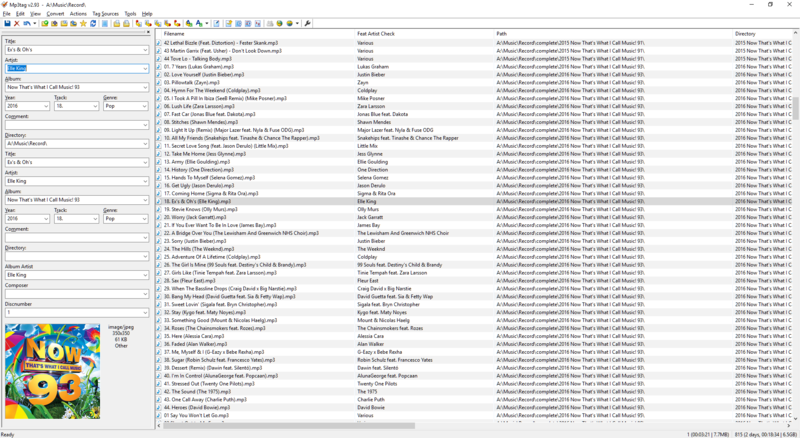 I am shocked by how difficult it seems to be to change multiple artists in bulk to 'Now That's What I Call Music!' within an action. Could you tell us why you use a action of the typ "Replace with regular expression" but you do not use a single regular expression? An action of the type "Format value" would be the appropriate one to assign a format string to a field. Also, you handle a number of user-defined fields like %album artist%, %albumartists% where you repeat the string that you have already stored in the standard fields ALBUMARTIST and ARTIST. You could use the field contents of these standard fields to fill the user-defined ones - for which ever purpose you might need them. I think these fields are utterly redundant. Thanks for your reply. That was one of many attempts to use various functions to try and achieve what I want. I was trying to cover all eventualities with those fields. 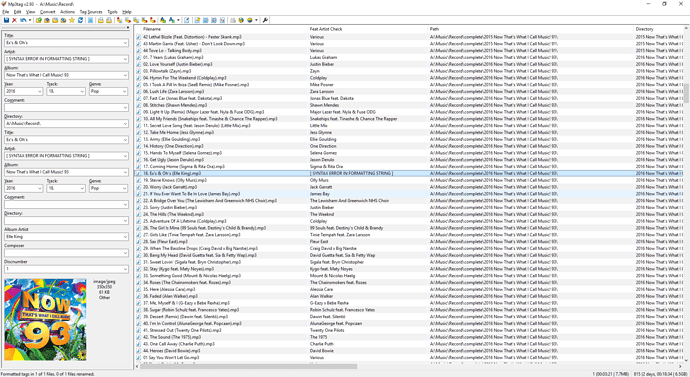 It looks like Artist and Album Artist are the standards according to the column headers, so I could just use those. I am still unsure what function will make this work. 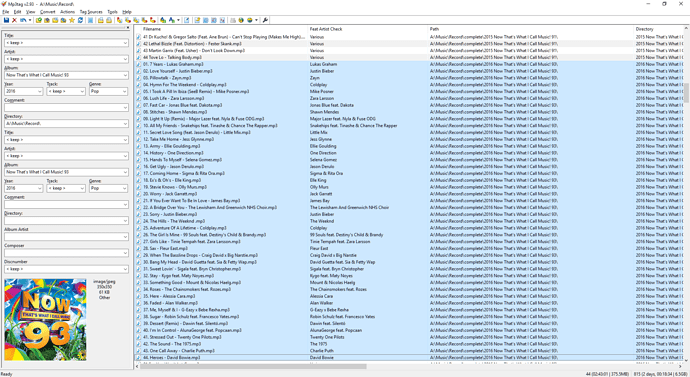 As each of the files has a different artist, I need to specify a tag rather than a specific artist and change each instance of that tag to 'Now That's What I Call Music!'. Please make yourself aquainted with the functions of the tag panel. One of the functions of the tag panel is to distribute data to all the selected files. where you should find that all the non-standard variations will not really improve the quality in the tags. Okay, so the fields you mentioned are the standard ones. I will use those, still not sure how to achieve this. still not sure how to achieve this. What is Meta tag from URL removal? If I wanted to remove the fields, it would be easy. seems to be the difficult one? I want to create an action to perform this task for me, so that it can happen automatically alongside several other actions. @sheepdisease, do you know that you can select multiple files at once, enter the desired value on the Tag Panel and save the change, effectively changing, e.g., the artist for multiple files at once? 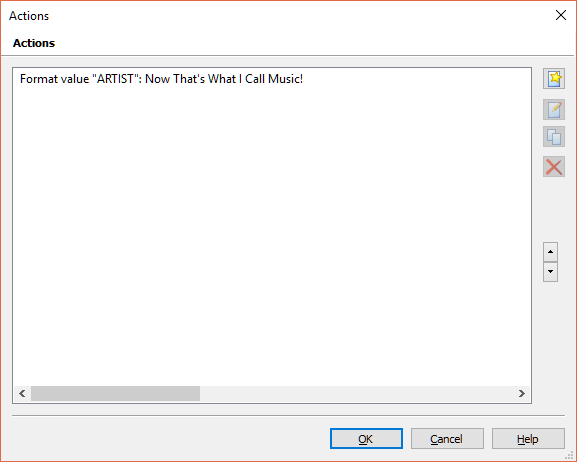 If you already know this and want to perform this change inside an action group, you can use an action "Format value" for field ARTIST (and ALBUMARTIST respectively). @ohrenkino has already pointed this out above, but I think it got lost in all the other advice he was trying to give. If you want to do yourself a favor, you can also read the help topic on Actions in Mp3tag and the FAQ: Actions and batch-operations. They give a pretty good overview on the different action types and what you can achieve with them. Hello Florian, thanks for your reply. I have selected multiple files at once and updated tags accordingly in the past but, as you suspected, I wanted to incorporate this into an action group. I cannot recognize any benefit of handling this with an action but your action should work. I noticed in your screenshots that you habve double entries of many tag-fields in your tag-panel. You have to delete these double entries, otherwise your tag-panel will not work properly. Hello Poster, since I first installed the application it has always been this way. All the music files I have tested mp3tag on have show up like this. It's the apostrophe in "That's" which is causing the problem. Not sure how to fix it, as I do want it to be included in the artist tags.